If you’re feeling down, this Healthy Blueberry Smoothie is the perfect pick-me-up-drink for you! It’s naturally dairy-free, gluten-free, plant-based, and sweetened only with fruits. If you’re feeling down and you need a little mood-booster, this Healthy Blueberry Smoothie is the perfect drink for you. You’ll only need 4 ingredients and I’m pretty sure you have everything at home for it already. This purple smoothie is my favorite smoothie right now. On hot summer days, you can substitute the bananas with frozen bananas, that way the smoothie will even have a cooling effect and it’s like an ice cream shake! So good! For this smoothie, I’ve used unsweetened rice coconut milk which is my favorite at the moment. Of course, you can use your favorite plant-based milk. There are tons of options: almond milk, oat milk, hemp milk, cashew milk, hazelnut milk, soy milk etc.. However, the bananas make the smoothie sweet enough, so I’d suggest using unsweetened milk. 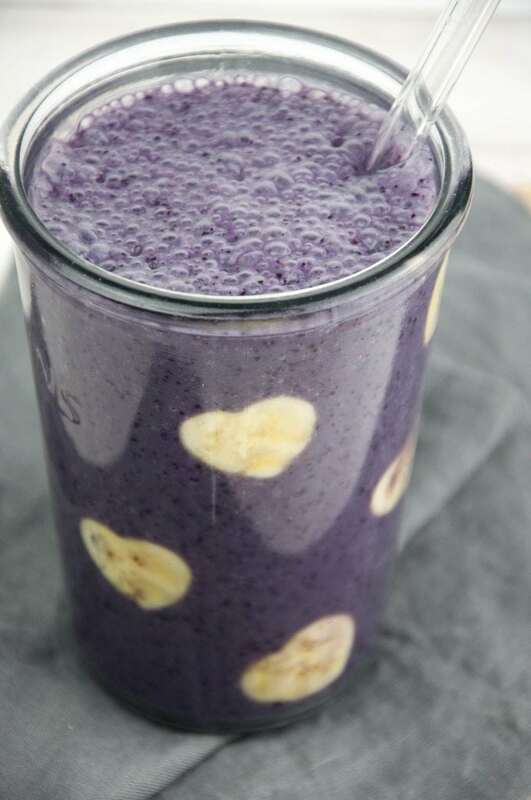 This healthy Blueberry Smoothie is a ‘Feel-Good’ Smoothie! Blueberries are truly magical little berries. Not only do they contain iron, magnesium, and potassium, they also reduce pain, are anti-inflammatory agents and increase the production of dopamine, which is the brain’s feel-good chemical. 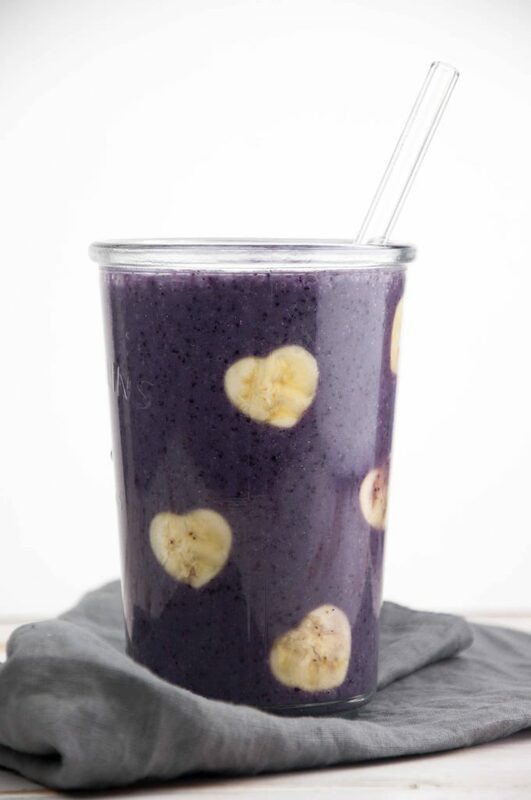 If you're feeling down, this Healthy Blueberry Smoothie is the perfect drink for you! Blueberries increase the production of dopamine! This smoothie is naturally gluten-free, dairy-free, plant-based and sweetened only with fruits. Toss all the ingredients in a high-speed blender and blend until completely smooth. If you want to have the banana hearts, cut off a few slices of the banana and cut out hearts with a small cookie cutter. 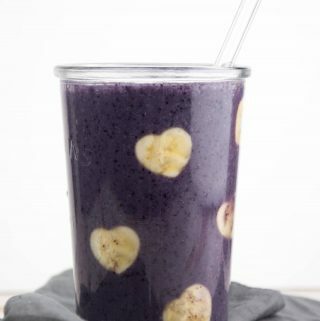 Press the banana hearts on the inside of the glass before filling in the smoothie. Kudos to you, Bianca, for putting heart shaped bananas in your smoothie picture. I love it.